Delivering superior cleansing and replenishing properties, the Omorovicza Hydrating Set promises to leave your complexion looking bright, smooth and healthy. Infused with Mallow Flower Extract to even out skin tone, its gel formula transforms into an oil when applied to the skin, and then into a milky emulsion upon contact with water to dissolve dirt and makeup for a refined, brighter complexion. Utilizing vitamin-rich Sea Buckthorn Berry Oil, the cleanser delivers a gentle exfoliating action to smoothen the skin's surface, whilst Evening Primrose Seed Oil regenerates a dull complexion to reveal a brighter, younger-looking appearance. A sulphate-free formula that effectively eliminates impurities without over-drying or uncomfortable tightness. 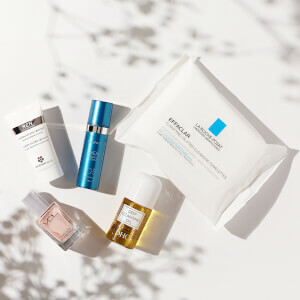 Harnessing the powers of Apple Pectin and White Lupin Extract, the delicately scented blue cleanser gently removes makeup, whilst delivering long-lasting hydration to reveal an energized, revitalized visage. The brand's patented Healing Concentrate™ delivery system leaves skin firmer, more supple and younger-looking. Cleanser: Apply to dry skin and massage well. Add warm water to form a milky emulsion before rinsing away. Cleansing Foam: Apply a pearl sized amount to damp face. Massage well then rinse thoroughly. Cleanser: Glycerin, Caprylic/capric Triglyceride, Aqua (Water), Sucrose Stearate, Phenoxyethanol, Microcrystalline Cellulose, Copper Gluconate, Prunus Armeniaca (Apricot) Kernel Oil, Ethylhexylglycerin, Oenothera Biennis (Evening Primrose) Oil, Cellulose Gum, Tocopheryl Acetate, Xanthan Gum, Salvia Lavandulaefolia Leaf Oil, Faex (Yeast Extract), Cinnamomum Camphora (Camphor) Bark Oil, Pelargonium Graveolens Flower Oil, Hippophae Rhamnoides Oil, Anthemis Nobilis Flower Oil, Malva Sylvestris (Mallow) Flower Extract, Phospholipids, Citric Acid, Sodium Benzoate, Potassium Sorbate, Helianthus Annuus (Sunflower) Seed Oil, and Rosmarinus Officinalis (Rosemary) Leaf Extract, Limonene, Citronellol, Linalool, Geraniol.